In the mid-90s the Philippine Government recognized that they had a national water crisis on their hands. Only 26% of the residents of Metro Manila had 24-hour access to drinkable water and the poor of the city didn’t have access to clean drinking water at all. In 1997 this changed dramatically for the East Zone of Metro Manila when the Manila Water Company utility took over management of the area. The company undertook a massive effort to reconstruct the entire water system, replacing 90% of it and achieving 99% 24-hour access to drinkable water across the East Zone by 2014. Since 1997, East Zone residents have seen significant improvements in their water and wastewater services brought about by Manila Water’s efforts to expand distribution lines and reduce system losses. These measures increased water availability from 26% in 1997 to 99% of the central distribution system to date. From delivering only 440 million liters per day in 1997, Manila Water has recovered water losses to deliver over 1.3 billion liters of water daily to 6.8 million residents. Out of these, around 1.8 million people from marginalized communities were given access to clean and affordable water through the company’s flagship program, Tubig Para Sa Barangay, or Water for the Community. Apart from caring for its customers by delivering safe and reliable water, the Company is also committed to caring for the environment. Manila Water ensures that water consumed by customers are properly treated before discharging it back to rivers and waterways. As the country’s leading used water service provider, Manila Water collects and treats wastewater through two methods: desludging of septic tanks and hauling the collected wastes to septage treatment plants, and direct conveyance of used water from households and commercial establishments via sewer pipelines to sewage treatment plants. These measures ensure that treated used water comply with the Class “C” effluent standards or water that is safe for aquatic life, set by the Department of Environment and Natural Resources. Ultimately, these used water management efforts aim to revive the three major rivers in Metro Manila—the Pasig, San Juan, and Marikina Rivers. This system has not gone unnoticed and many other Asian nations have also partnered with Manila Water because of it. The nation of Malaysia has recently been experiencing water shortages and is beginning to think seriously about long-term solutions. They are looking in on what has happened in Flint, Michigan with the lead poisoning and to Cape Town, South Africa, which considered turning off its taps and face the biggest water crisis in this century. With these things in mind, Malaysians are looking at how water management has functioned in Manila and really admire how Manila Water handles its relationship with the people. “Looking back, in the Islamic civilization, building of water infrastructure was funded mostly by waqf (endowment funds). The wealthy contributed towards building and maintaining water canals, aqueducts and wells to benefit the public. In fact, water resources were managed by communities through acts of cooperation and mutual understanding. It is only recently that communities became disconnected from their water resources and put their trust in the government to supply clean potable water. Communities can play an important role in maintaining infrastructure for urban water supply. Determining, developing and maintaining levels of service is an integral part of infrastructure asset management, especially in water utilities infrastructure management. Often minimum service levels are set by local, regional or state, and federal/national regulation. Community consultation and engagement is critical to ensuring that the water utility services planned and delivered are required and supported by communities and that the levels of service are matched to what the community requires and is prepared to pay for. The case for community engagement with water utility management is being made throughout Asia, with Manila Water at the forefront. Please CLICK on the image to see the videos! Watch our Latest Asset Management Vlog! MORE Asset Management Video Blogs! JOIN INFRAMANAGE TO GET MORE ONLINE EDUCATION, FREE! Create an account now and login to browse the Infrastructure Asset Management learning we have published for you! FREE eBOOKS FOR YOU! BOOST YOUR INFRASTRUCTURE MANAGEMENT EDUCATION! "Introduction to Practical Asset Management"
CLICK on the image or anywhere on this text. BUILD YOUR ASSET MANAGEMENT KNOWLEDGE & SKILLS HERE! CLICK and watch Ross Waugh present the Infrastructure Asset Management learning resources at the Inframanage.com site. SEE OUR CLIMATE ADAPTATION RESOURCE SITE! SEND US YOUR INFRASTRUCTURE ASSET MANAGEMENT QUESTIONS! CLICK on the image above to know more about ASK INFRAMANAGE! 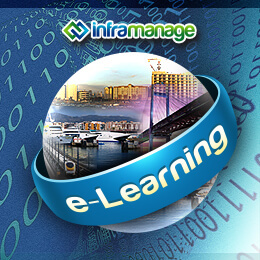 e-LEARNING offers premium Infrastructure Asset Management Online Learning. Christchurch Terror Event Reflections – How Can We Make a Difference? BECOME AN INFRASTRUCTURE ASSET MANAGEMENT EXPERT!